Email encryption has become a hot topic since the revelations by Edward Snowden in mid‑2014 that the NSA gobbles up every email message you send, then scans it to ascertain whether it might contain something "interesting", such as your business plans. Email encryption prevents this, and doesn't have to be difficult. This software is easy to use but nevertheless provides strong encryption. Email Encryption End-to-End makes it easy to send and receive encrypted email. It can be used to encrypt a message to be sent via any desktop email program or webmail that supports attachments (that is, files attached to a message). The encrypted message consists of a text message (up to 60 KB in size) plus, optionally, an appended file of any type (up to 1,980 KB = 1.93 MB in size). 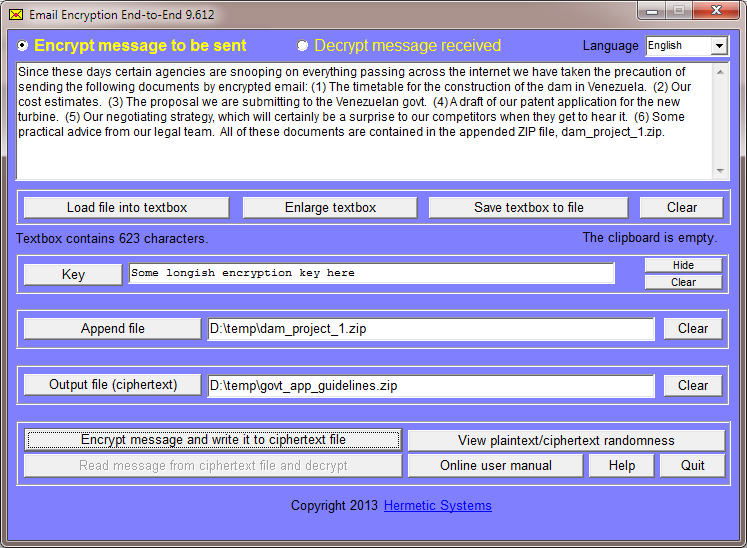 The message (including any appended file) is encrypted and written to a ciphertext file. You then attach this file to an ordinary email message. Thus your message is encrypted before it leaves your PC to go to the mail server, and it remains encrypted during transmission to the recipient's ISP and while being downloaded to the recipient's PC. Thus the message is encrypted "end‑to‑end", and, if intercepted anywhere between your PC and the recipient's PC, cannot be read.